After reading postings in the PSN-L Mailing list archive, I was inspired to build a seismometer of the Shackleford Gundersen type, but with both N/S and E/W capability using a previously unused hinge design. Using this configuration, the device is sensitive to vibrations in both directions. Two seismometers in the one package. See links at the base of this page for information regarding these types of seismometers. The seismometer is covered by (but not touched by) a stained wood cabinent of pine and oak with brass trim. Gauges show the status of the internal pendulum, a USB connection is provided for connection to an external computer, and a sound sample board is internally provided for an audio alert to vibration detection. 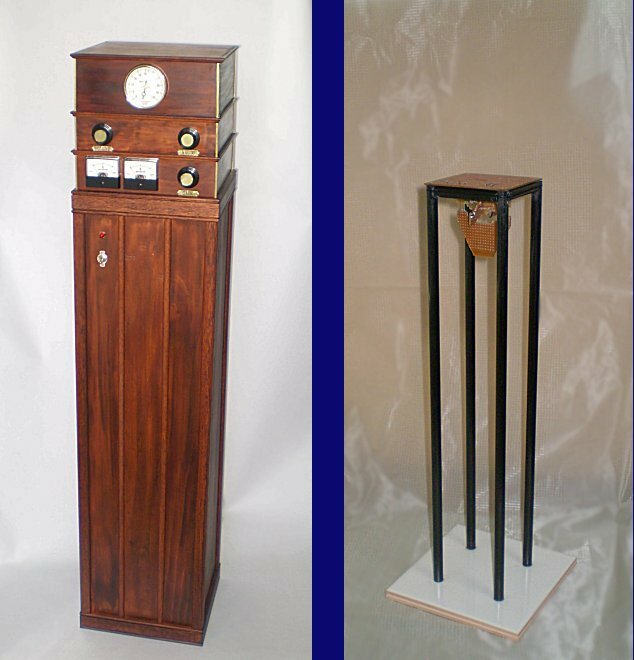 The cabinet stands 44 inches / 112cm high and is a three sided box, open at the rear. The pendulum arrangement (about 16 inches / 41cm high) stands behind it. Shown also in the picture above (to the right) is the heart of the machine - the bidirectional hinge device, of fiberglass (with fine brass wire flexures), hanging from a carbon fibre structure, on a ceramic base. These materials were chosen for low thermal expansion properties. A closeup of the hinge. Hard to see, so I've also shown a false coloured version. In the SG type of seismometer, the pendulum has copper plates acting as a radio transmitting antenna. For this version, two crossed transmitting plates are constructed, and two crystal controlled oscillators are used. One running at 3.5 Mhz, the other at 4.0 Mhz. Two sets of receiving antenna plates are required with two tuned detection circuits, as well as two sets of damping coils and magnets. 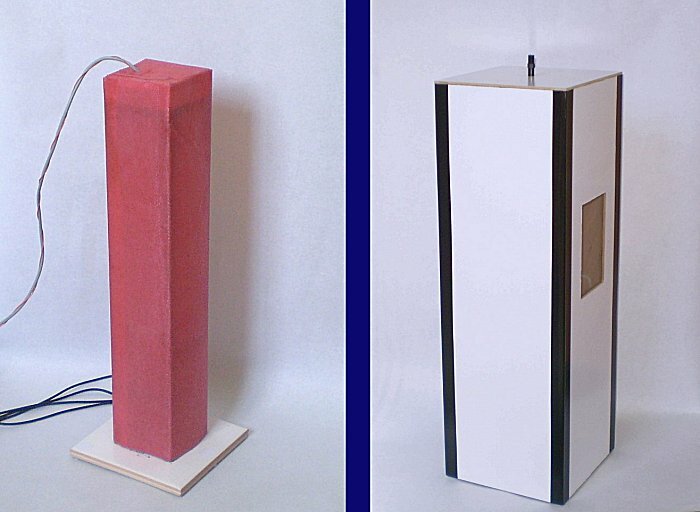 The pendulum arrangement is shielded from wind inside a (red) fibreglass box. This, and the detector/damping circuit board is further shielded again in another (white) box (about 7 inches / 17cm wide). The window in the side is for viewing some 'tilt' LEDs to assist in levelling. This box then sits behind and within the wooden cabinet. The software shows each data channel separately - the NS in red and the EW in green. Also shown is a direction indicator, which in theory would show the direction of an earthquake.